The pigeon is BACK! And he STINKS! No, really, he actually smells very bad. Except that Pigeon disagrees – as usual! “Smell? What smell? I don’t smell. YOU smell.” Uh-oh. This discussion is just getting warmed up. Pigeon took a bath last month! (Maybe.) The water’s too hot. Anyway, clean and dirty are just a matter of opinion, right? Mo Willems is a writer, illustrator and animator best known for his iconic Don’t Let the Pigeon Drive the Bus!. 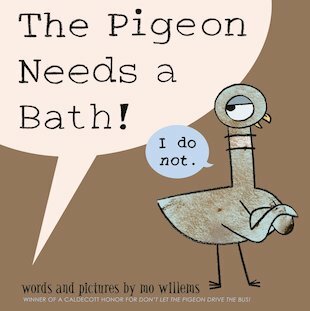 Mo Willems has won several awards for his picture books and animation, including a Caldecott Honor Award for Don’t Let the Pigeon Drive the Bus!.